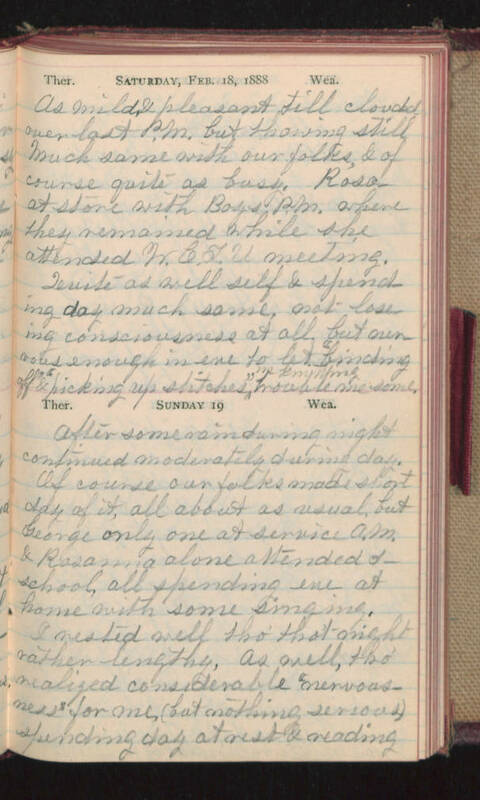 Saturday, Feb 18, 1888 As mild, & pleasant still clouded over last P.M. but thawing still. Much same with our folks & of course quite as busy. Rosa at store with Boys P.M. where they remained while she attended W.C.T.U. meeting. Quite as well self & spending day much same, not losing consciousness at all but nervous enough in eve to let "binding off" & "picking up stitches" as knitting trouble me some. Sunday 19 After some rain during night continued moderately during day. Of course our folks made short day of it, all about as usual, but George only one at service A.M. & Rosanna alone attended s-school, all spending eve at home with some singing. I rested well tho that night rather lengthy, as well, tho' realized considerable "nervousness" for me (but nothing serious) spending day at rest & reading.